I feel terrible about it. Trust me, if I could have scraped the bottom of the barrel for the ounces of energy that it takes to upload hundreds of pictures and throw words up around them for you, I would have. Every spare moment I've had over the past couple of weeks has been spent at the new house, and I'd love to tell you it's ready for us to move into. Unfortunately, it's not. But we're inching closer. SHOULD BE IN BY CHRISTMAS. Dare I say, my contractor works at the pace at which I blog. I'm not sure if I ever told you what I actually coveted for my countertops, but it was Carrara marble. My kitchen Pinterest boards were full of it. 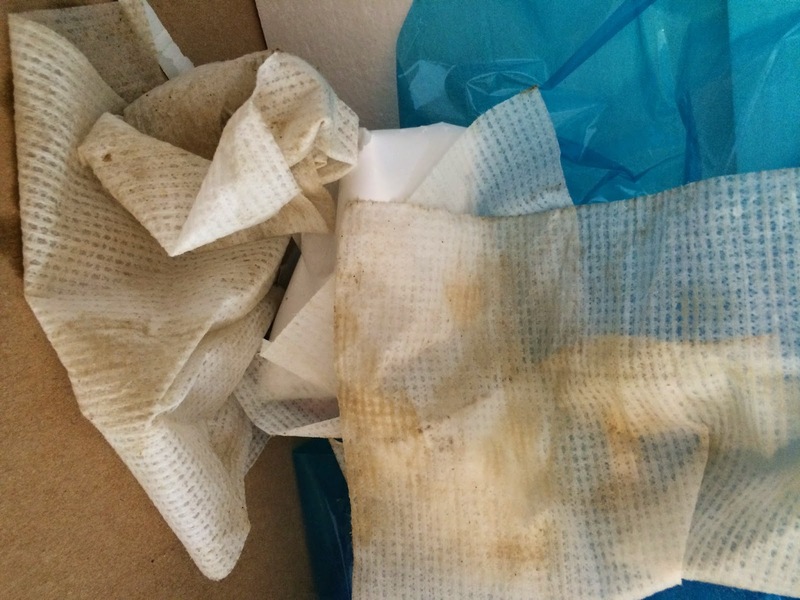 But it's just not practical for us ... it's porous, so anything you spill can stain it, and you need to seal it a couple of times a year to try to keep it in pristine condition. Does that sound to you like something I have the time or memory to do? NO IT DOES NOT. Anyway, I knew I could neither afford the price nor the upkeep of marble, so I'd decided I needed to go with another granite (which I've had at our current house for about 10 years) or quartz. I really wanted quartz, and I found a marble-lookalike at Maranatha Granite just south of Birmingham, in Pelham. It's Cashmere Carrara Quartz, and while it's not going to fool anyone into thinking it's marble, the tones are similar, and it's MUCH lower maintenance. It went in last week, and it looks great. I know this is kind of anti-climactic for you guys. This isn't like a Before and After. This is like a Before and a During. And a During. And Another During. AND ANOTHER DURING. The other day my friend Jamie was like, "I really just need you to go ahead and move." Anyway. 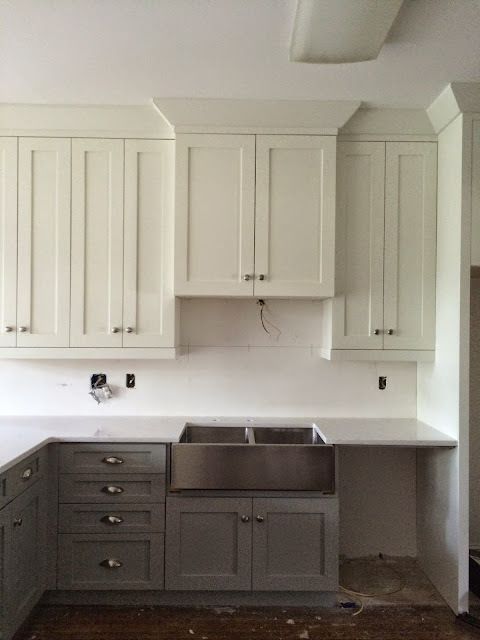 Countertops get us one step closer to that humble goal. Just to reinforce my reputation as The Girl Who Refuses To Be Happy With Anything, I would be remiss not to point out that the three corners on the countertops you can see in this one photograph are all different radii. In particular, the two closest to this edge of the frame ... the one on the left is a really wide radius, and the one on the right is narrower (if that's the correct terminology). I'm so big on symmetry that this discrepancy just about kills me. However, the countertop guys and I had a loooooong conversation about it, and they cut it that way for safety reasons because it's in a high-traffic area and the left corner sits right at the base of the stairs. I would have been happy to sign a waiver to get around that -- which is what they said I would had to have done -- but we never discussed it. Lesson learned, Internet, lesson learned. At any rate, they're beautiful and I'm happy to have them. 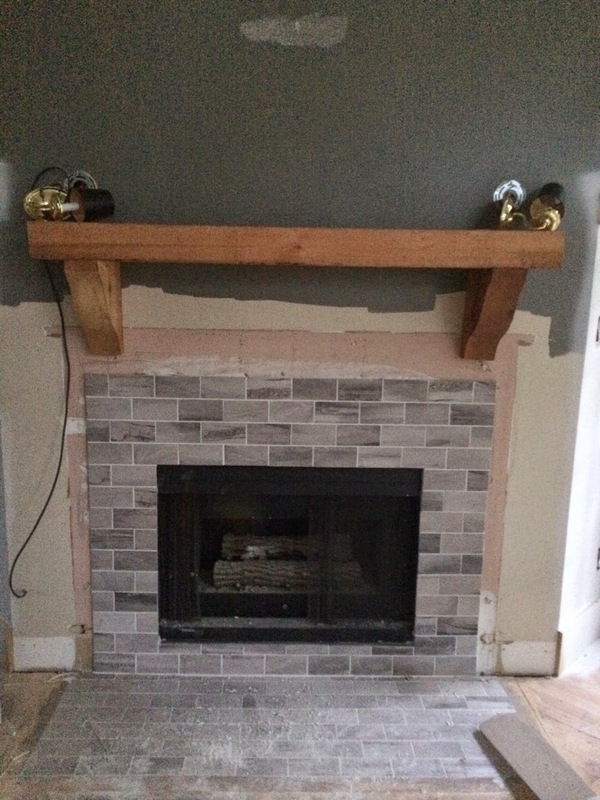 The backsplash will be the crown jewel of the room and will pull it all together, so once that's in, I'll have more pictures to share. 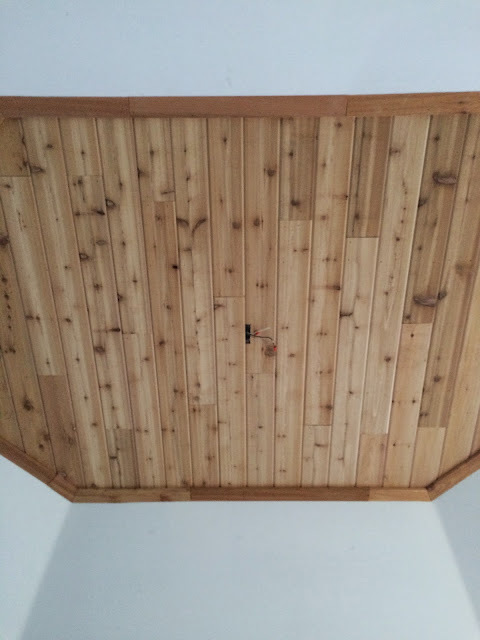 Upstairs, the second of the two wood accent walls is finally finished in the kids' loft. 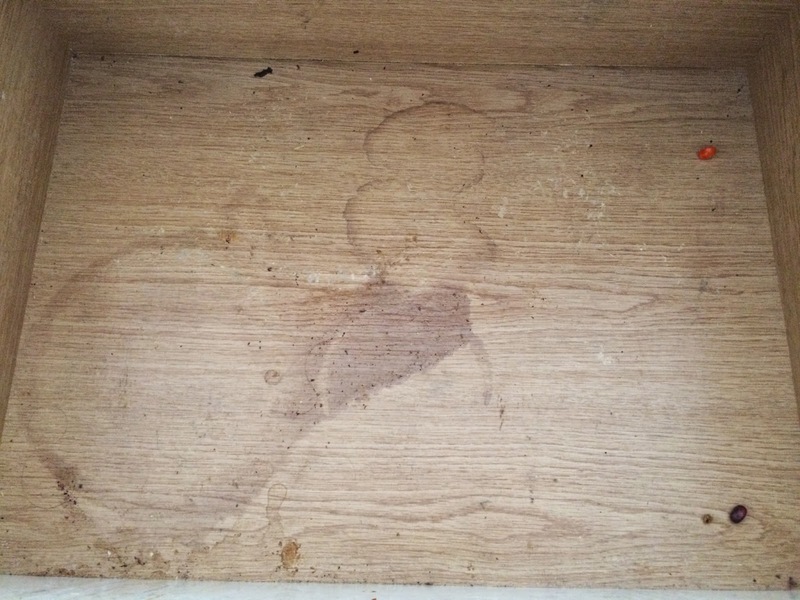 I've been working on stain samples for a couple of weeks now to see what kind of blend I want to do. See my sample board? But the longer the cedar is up, the more I think I may just want to leave it natural, because the wood floors downstairs will be dark and a nice contrast to the wall down there, and upstairs the carpet should be enough contrast. I don't know yet. 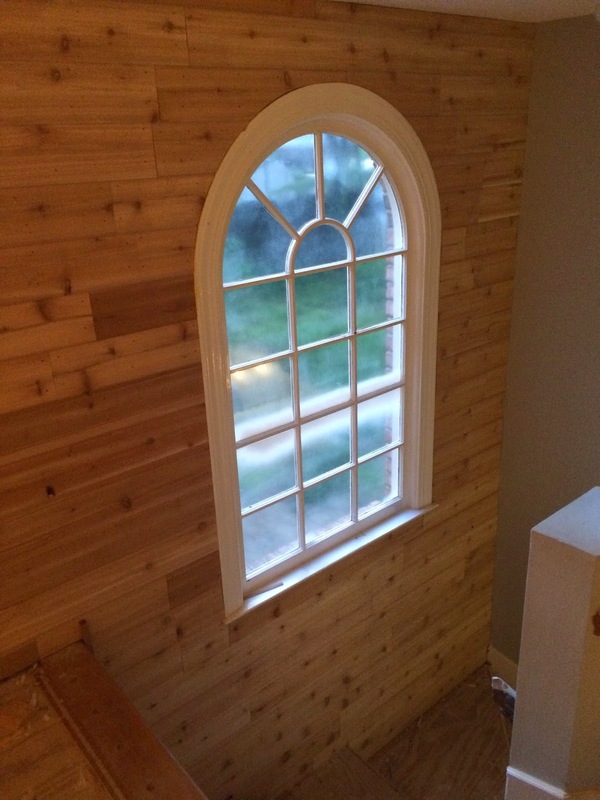 My contractor would like very much for me to tell you that cutting that cedar to fit around this window took nine hours and was almost the death of him. I apologized to him for having windows. 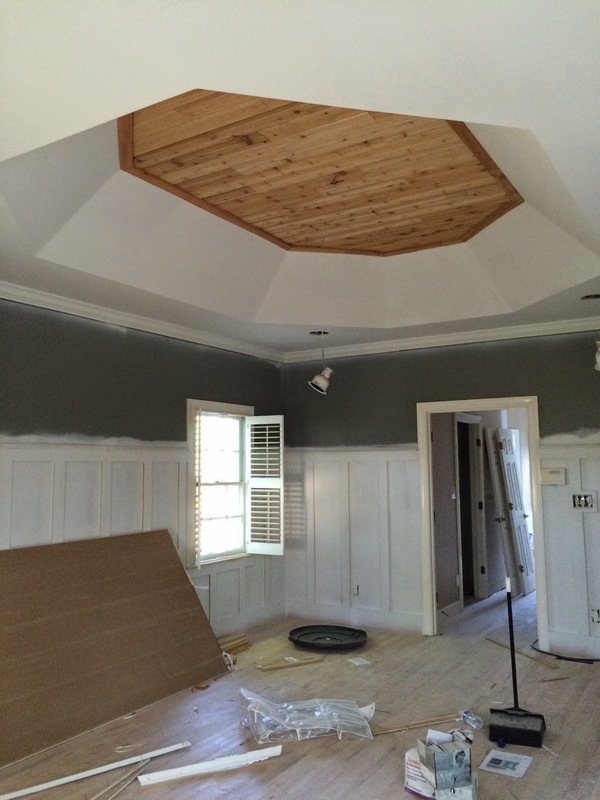 As he was close to finishing up with the wood walls, I asked him if he'd have enough left over to clad the tray ceiling in the master bedroom with the cedar. He thought he would, so he put that on his list. I'm so pleased with the way it came out ... 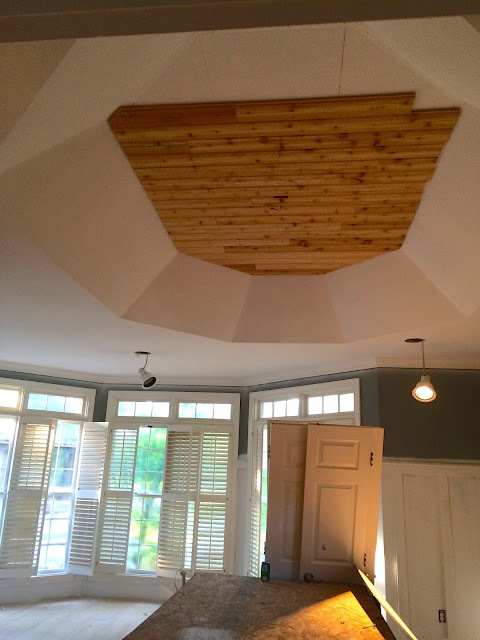 I think it adds a really nice element to the room, and I chose a kind of rustic ceiling fan to go up there. I walked over to the spot where our bed will be and looked up at it to get a sense of what it will look like when we're lying in bed. I think it's a nice tie-in to the cedar mantel that the contractor just installed over the fireplace. It's, um, substantial. In the master bathroom, if you follow me on Instagram or Twitter, you've already seen the tile in there. I chose a tile that was within my budget (imagine that! 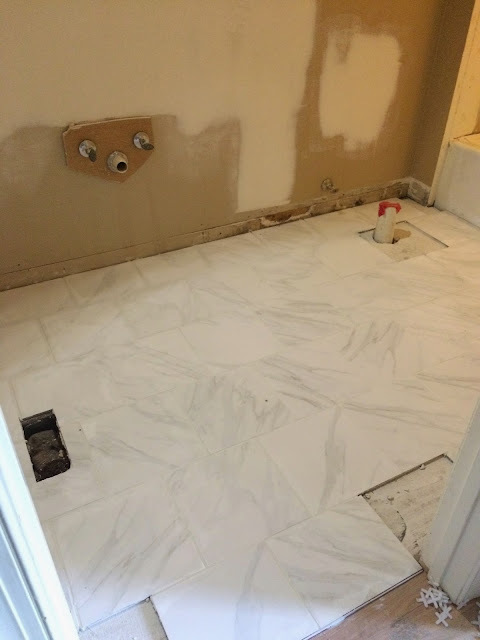 ), but I wanted it to look more upscale so I asked the tile mason to lay it in a herringbone pattern. He was baffled. Also: he didn't want to do it. He and my contractor both kind of tried to talk me out of it, saying that they didn't think the bathroom is big enough for it. I asked the tile mason to lay it out dry for me (just a small section) so that I could come see it before making a final decision. When I got there, something was "off," but I couldn't tell what. I finally figured out after moving 90 degrees to the left that I liked it better from the other angle, so we turned the entire pattern 90 degrees. It worked! 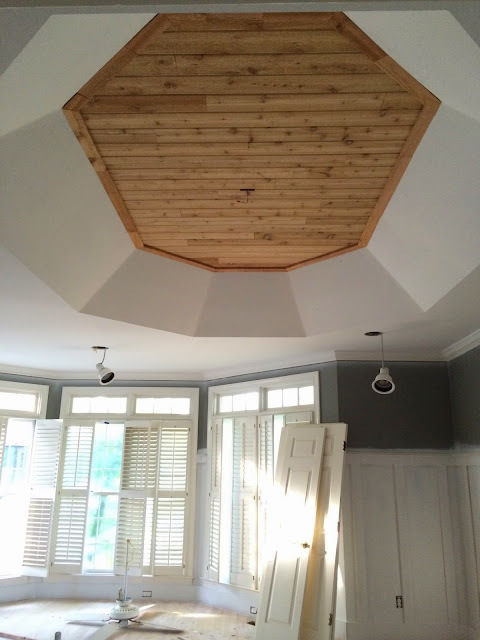 He and his son worked through the entire weekend laying it, including multiple really intricate cuts around the door trim. And it came out wonderfully! They grouted it on Sunday afternoon, and the tile mason's wife came by to look at it. Spoiler Alert: SHE LOVED IT. They're getting ready to renovate their own master bathroom, so I wonder if he'll soon be laying his second herringbone pattern. I'll get a better picture later, when the grout haze and dirt have been cleared away, but here's a close-up of the floor ... and the grout is "bright white," but it was still wet when I took this picture. Down the hall, the guest bath got the same tile, but in 12x12 instead of 12x18. Also, it's laid in a staggered pattern, not herringbone or anything too fancy. Of course, since it's not just in standard square-over-square format, my contractor said, "I haven't done anything 'standard' for you YET." AM I HIGH-MAINTENANCE? I DON'T THINK I'M HIGH-MAINTENANCE, INTERNET. Out in the garage, I had a lot of work to do. 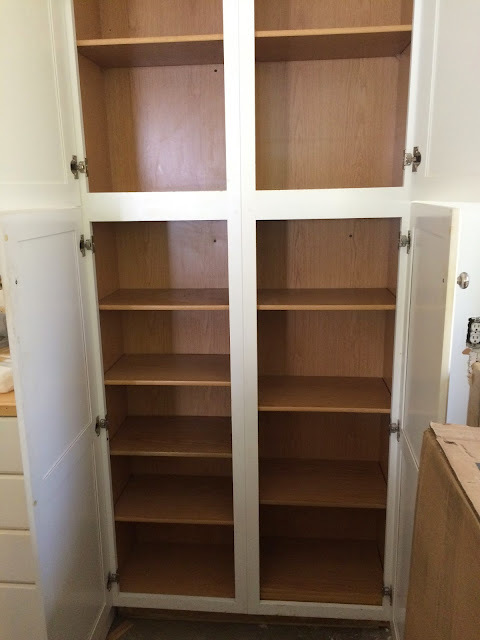 I cleaned out -- like, Lysoled and Cloroxed -- all of the old kitchen cabinets that we'd pulled out and installed out there. And that was A JOB. 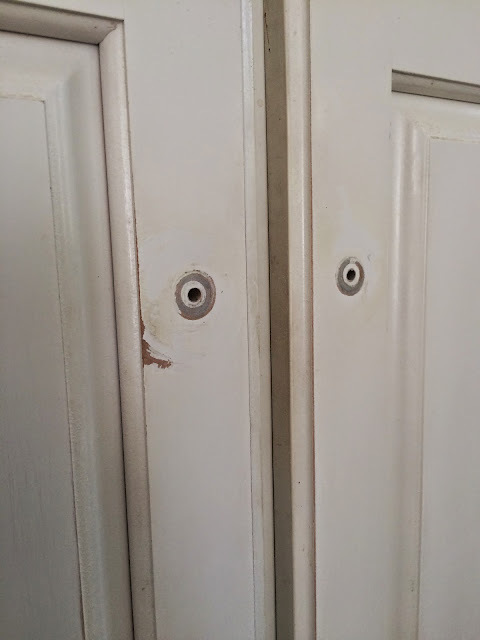 This cabinet had chocolate-syrup rings on almost every shelf, and it had dripped down the sides. 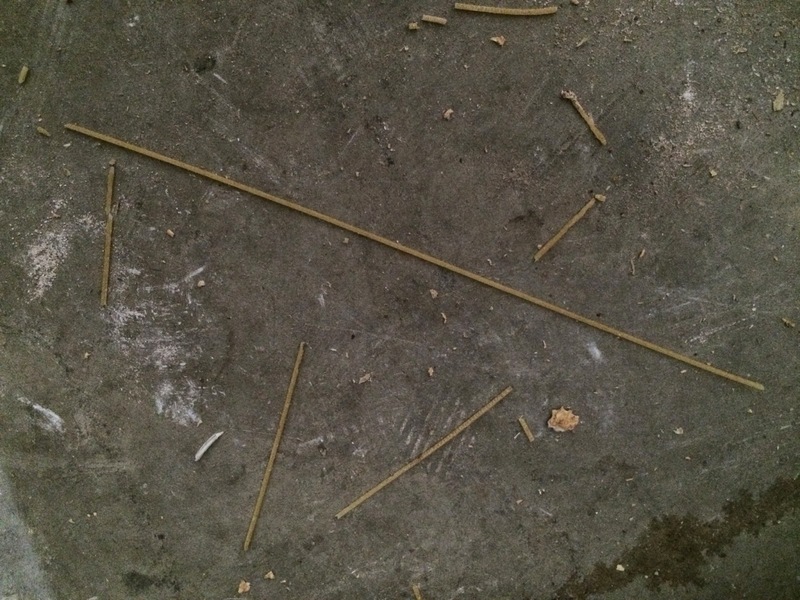 The bottom of the cabinet had what must have been half a package of old spaghetti noodles rolling around in it. Here are a few stragglers. 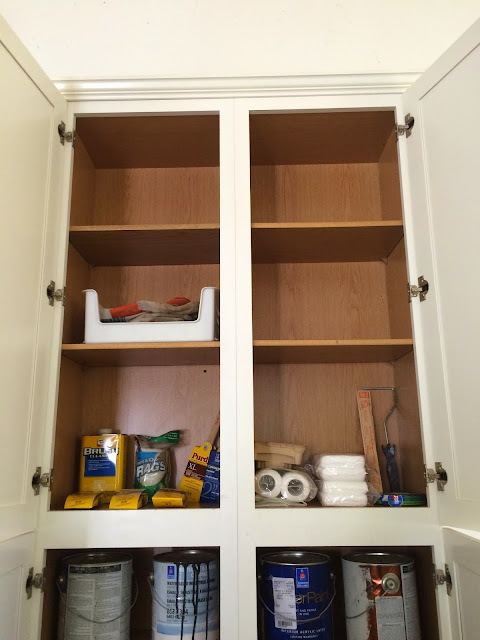 I used one-and-a-half canisters of Clorox wipes on these cabinets and drawers. No lie. 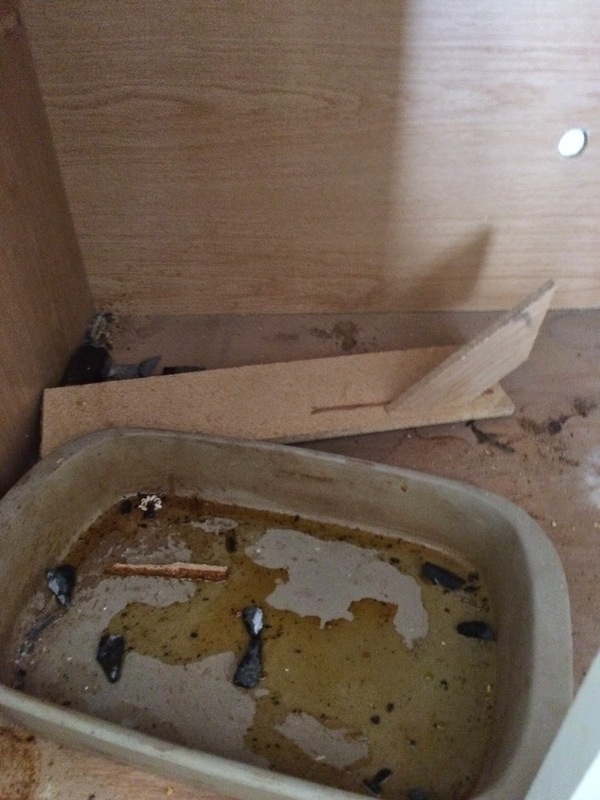 I think there were some rodent droppings in some of them. I mean, Y'ALL. I almost gagged. I. HAVE. NEVER. And then I got to this cabinet. Yes, yes I did actually clean that entire thing out. 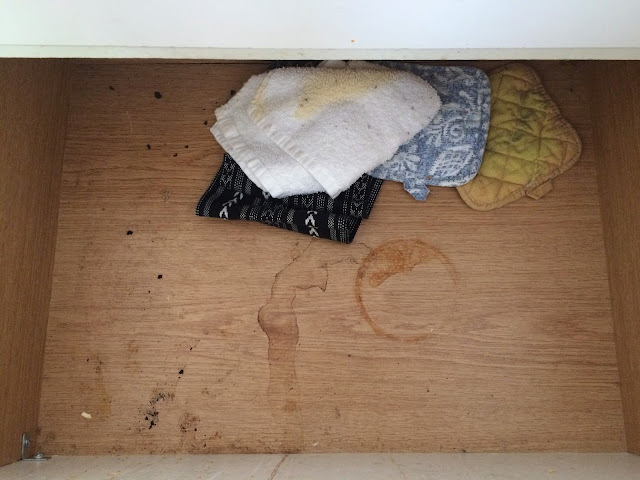 I physically GOT IN THAT CABINET and scrubbed the whole thing out. Not sure I've ever been more proud of myself. 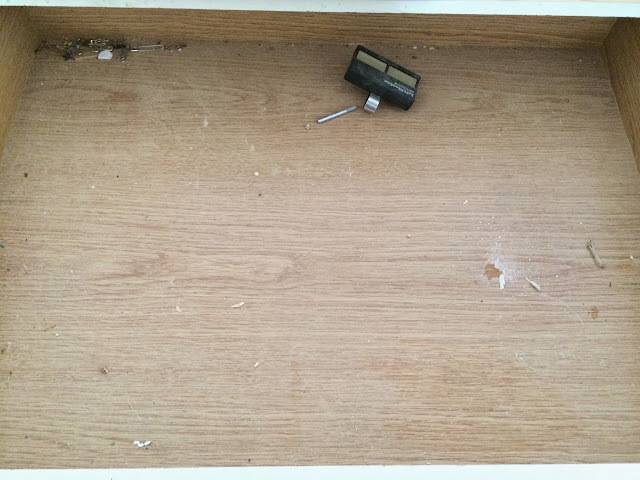 Next, I got out my new sanding block (so I wouldn't get blisters from sanding with the sheets like I did last time) and sanded down every inch of those cabinets and drawer fronts. They were sticky to the touch because they had a layer of grease on them that was about two centimeters thick. Did I know what I was doing? No I did not. I'd never done this before, but I figured it couldn't be that different from when I did the dresser. And I was right. Same process. I just sanded off the top layer, which I'm trying to show you with cell-phone pictures ... you can barely see through the white paint here. After it was all sanded down, I took a damp cloth and wiped all the sawdust off. 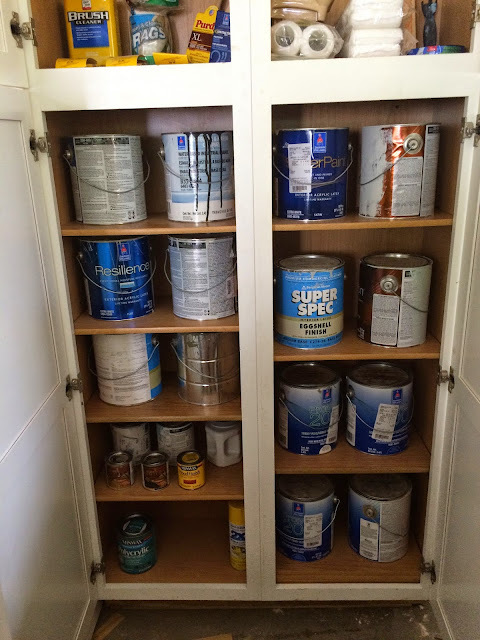 Then I grabbed a gallon of Sherwin-Williams' Sea Salt that I'd never opened but had been dying to use, and I started painting. Most people seem to recommend using a foam roller for cabinets. I didn't have one, so I used my 2.5-inch Purdy brush. Worked fine. Sea Salt is a beautiful grey-green, and it really brought out the warm tones in the wood so much more than the white paint had. 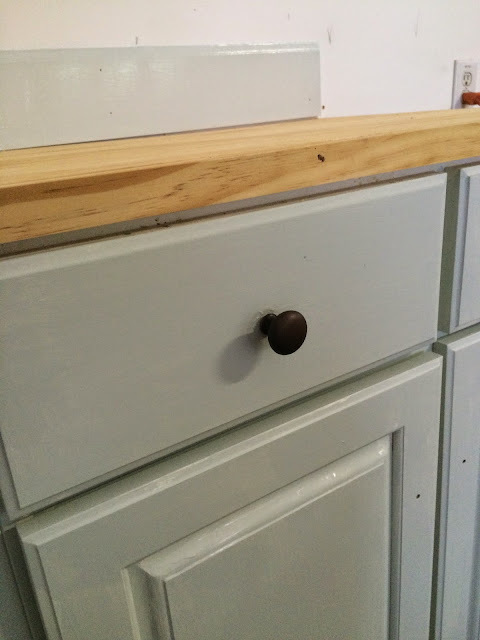 I still have to paint a second coat and then go over it with polyurethane (because I only had wall paint, which will never hold up on cabinets), but I loosely screwed a new knob on so you could see how it looks with the new hardware. Here's a broader look all the way down the wall -- the blank spot in the middle is for our white fridge that's currently in our basement. It's not a "major" makeover, but I'm really happy with it. Just because it's in the garage doesn't mean I don't want to love it. One of the next things to be tackled is the backyard. Other than the fence and a landscaping PLAN, I haven't done anything with it yet. It's, um, gotten out of hand quickly because of all the rain we've had. We're about to get started on it, but our yard guy is a part-timer, so it's going to take a few weeks, I'm sure. Still, this might be a nice Before-During-During-During-During-After, too. Finally, while I was working at the house on Sunday, I added something to one of the exposed doorframes before it got covered up with drywall yesterday. One day these long months of working and waiting will be far behind us, drops in the bucket. And even though it will be hidden under the kitchen doorframe, I will be reminded daily of what is most important.